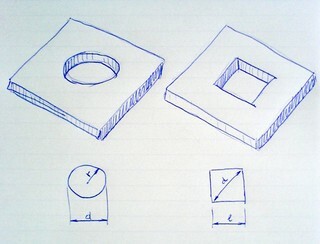 What is the shape of the pinhole? Typical shapes are circles and squares. Circles are more convenient from the optical point of view, but making size-varying pinholes is technologically easier with square shapes. How is the physical pinhole size reported by the microscope? a length expressed in Airy Disk units. This length can typically be a diameter (for circular pinholes) or a side or diagonal (for square pinholes). It is important to know both the size units and to what magnitude the size is referring to. In the Airy disk case, to which WaveLength is the disk referred is also relevant: is it a constant figure, or changes from one channel to another while the excitation/emission wavelength change? What is the microscope (fixed) internal magnification? Not only the objective magnification is necessary, any other internal magnification between the pinhole and the sample must be considered. Device attachments and fixed lenses introduce extra magnification that must be taken into account. If you can provide this setup description we can update our Backprojected Pinhole Calculator to include a new microscope model. Please contact Svi Support to send the information.